Ruark R1 MkII DAB/FM radio gets a spring/summer makeover | What Hi-Fi? 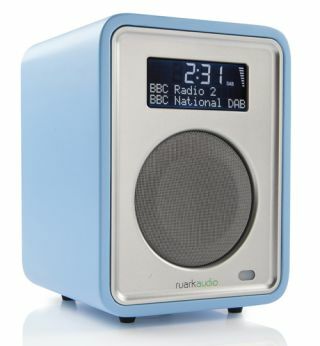 The Award-winning Ruark R1 MkII DAB+/FM radio is now available in a limited edition pastel blue. Buyers can also choose between a tan or black leather CarryPack, and when combined with the optional BackPack rechargeable battery the R1 can easily be taken out and about. Portable devices such as an iPod or iPhone can be connected via the line input, and if you use the radio at home there's a line out socket to connect it to your hi-fi. The large format display automatically adjusts to suit the ambient light conditions, and a multi-function alarm is included as standard. The Ruark R1 MkII is available for £160 through stores including John Lewis, Selfridges, The Conran Shop, Heals and specialist audio stores.